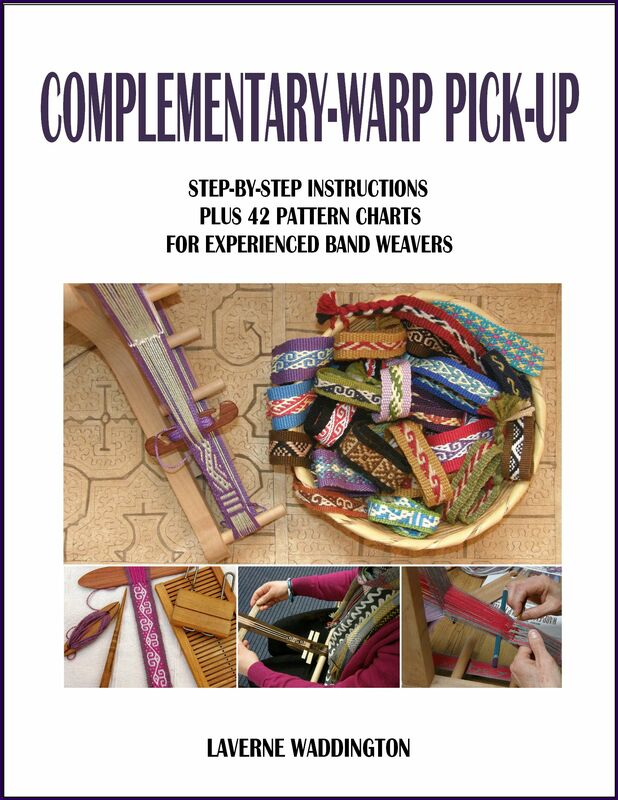 I decided some time ago that I wanted to devote myself more to ”big” projects on my backstrap loom….longer and wider and with a greater number of ends. But, as I put my latest big one aside, I felt that it would be fun to play around with some smaller ones for little while, something like a pouch for my iPod, for example. However, after several days of searching through books and web pages, finding ideas for patterns, adapting them and charting, erasing and re-charting, I have come to the conclusion that even the projects that are small in physical terms are, in fact, ”big”….and that’s why I like them. I like putting in the time to search and sample. I could do without the do-overs that are sometimes necessary but that is all part of the process. It’s nice to look back at the first steps towards the weaving of my most recent project…the silk paisley scarf… and then look at the finished scarf lying on my bed. I think that perhaps the first thoughts about tones of blue sitting next to crisp, clean white entered my head when I came across the image of the Roussel painting, above. Gathering colors…three tones of blue, white and assorted colors. Deciding on the first shape to chart. Other first steps involved sampling, lots of it. I have three small abandoned paisley samples which I am now willing to throw away plus a chart that is well-worn from all the erasing and adjusting. There’s the memory of this first warp which got put back on the warping stakes and unwound back to zero. One of my stakes had shifted on the first attempt and the tension was off. I have a tangle of blue 60/2 silk…the one part that didn’t survive my attempt to unwind and re-warp. I tell myself I’ll sit down one day with a good movie and untangle it, but I doubt it! And now the scarf is done…washed and pressed and showing off its lovely sheen. Until the iron started pressing and lifting the dampness from the fabric, it was refusing to look or behave like silk at all. I am really happy with it. Now what should go next on my loom from the list of ideas I have? I have been carrying my iPod around in a sweet sprang bag that Tracy made for me but I decided that it really needed a woven bag of its own…a bag big enough to carry the iPod as well as its charger. 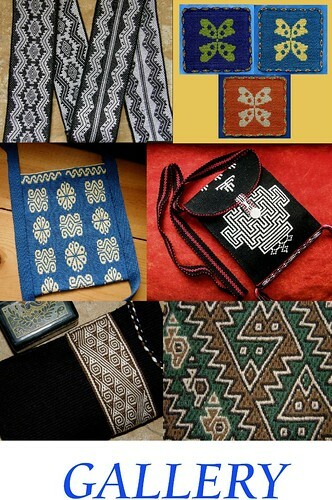 I had seen some photos of pre-Columbian textile fragments online and a particular motif had caught my eye. 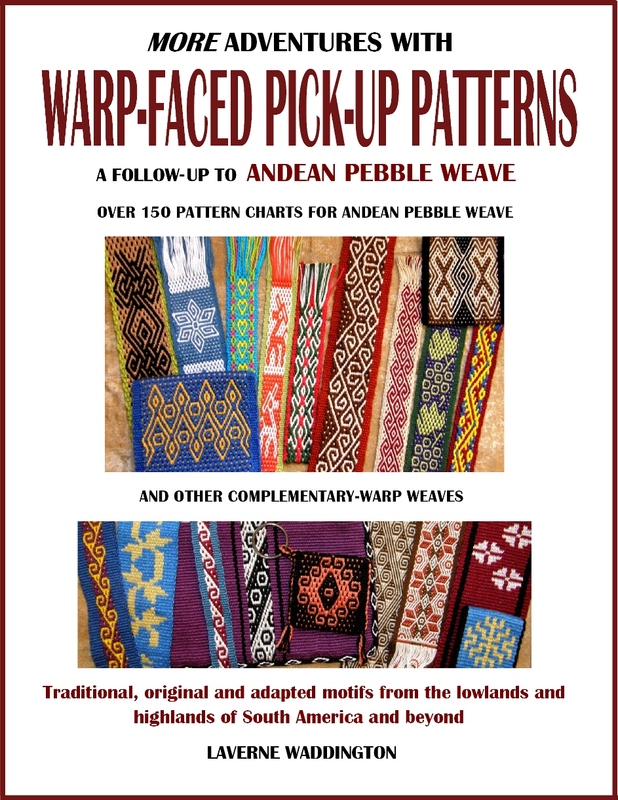 I charted something based on that and added a border pattern with the idea of weaving it with supplementary weft on a ground of 30/2 cotton I had bought way back in 2013 from Mayan hands. It’s the same cotton I had used for the journal covers I wove some time ago so I knew how it behaved. I had all the figures in my notebook from those projects and so I didn’t need to sample. I just needed to figure out the width I wanted and calculate the number of ends. How do you like that bright pink tatting thread for the heddles? I installed a coil rod because the cotton base structure would be plain weave. Of the number of ways that I know of preventing the ”corrugated” look that my plain-weave cotton fabric sometimes gets, the coil rod is my (current) favorite. I much prefer it to another method which would involve turning the loom around and weaving an inch or so at the other end. This cotton is not mercerized. There was a kind of tearing sound as I opened the sheds as the threads clung and scraped past each other but there were no breaks despite all the strumming I needed to do and everything stood up well. Cindy and I bought this cotton at ANWG 2013. I bought a bag of this color labeled ”champagne” and Cindy bought the indigo. We shared the two colors. I was content to have a motif on just one face of the pouch and so I finished it off with plain weave, doubling the weft so that the rest of the fabric would have the same weight as that which included the supplemental weft. And here’s the finished pouch…hand sewn. I was glad that I hadn’t forgotten how to put in a zip. This project was supposed to give me a small break before launching into another ”big” one….but then I got distracted by a post in one of the online groups about the ”turned Krokbragd” that many people are weaving on their inkle looms and it reminded me that I had always wanted to weave a music-themed bookmark for a piano-playing friend of mine. 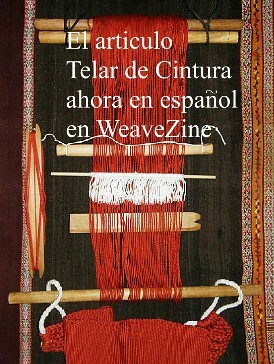 I chose to do it in warp-faced double weave using 60/2 silk so it would be fine enough to make a good bookmark. I set up my warp with four sets of string heddles, something I only do when weaving double weave if the thread is particularly fine or if there are a lot of ends. 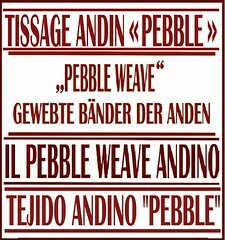 I didn’t need to sample as I knew how the silk behaved in double weave, thanks to various woven samples and the notes in my notebook. Of course, I didn’t feel that I needed to chart the piano keys. However, I got a little cocky and tried to eyeball the length of the black keys rather than count threads and paid the price for that in the first two attempts. Placing a marker on the 55th black thread made picking the colors for those black keys much faster. After a couple of repeats of piano keys, I got bored! Then I decided that it would be fun to weave a couple of bars of music. And now, of course, the ”project’ has turned into a ”sample”. My piano-playing friend will have to wait for his bookmark because weaving in those bars of music will make this piece much longer than any bookmark needs to be. Once my curiosity has been sparked, I need to follow through. The ”small” project has suddenly become big as the charting paper comes out. Once I have charted the notes and woven them, I guess I will go back to the beginning and figure out how to place all of this in a bookmark that is not ridiculously long! Hopefully, I will be able to show the finished sample in the next post and we will see if you can recognize the melody I chose. I love the piano keys! They were fun to weave, Barbara, and ridiculously quick and simple once I placed marker threads for the length of the black keys. Thank you, Denise! It’s so nice to be able to keep in touch with your this way. Thank you so much, Jim. I am amazed at what you can do with the backstrap. It is truly a remarkable tool — industrialization doesn’t mean “better”! Yes, I love its simplicity and it’s wonderful as long as time is not an issue…!! But then, I am more about process than product. once a year and his next concert here is on Sun so your post is timely. I look forward to seeing your melody!. I love the piano keys… and everything else! I have tried weaving on a backstrap by accident (it was a mini-lesson on card weaving), but I find my interest is growing. I’ll be visiting your blog often. Welcome! 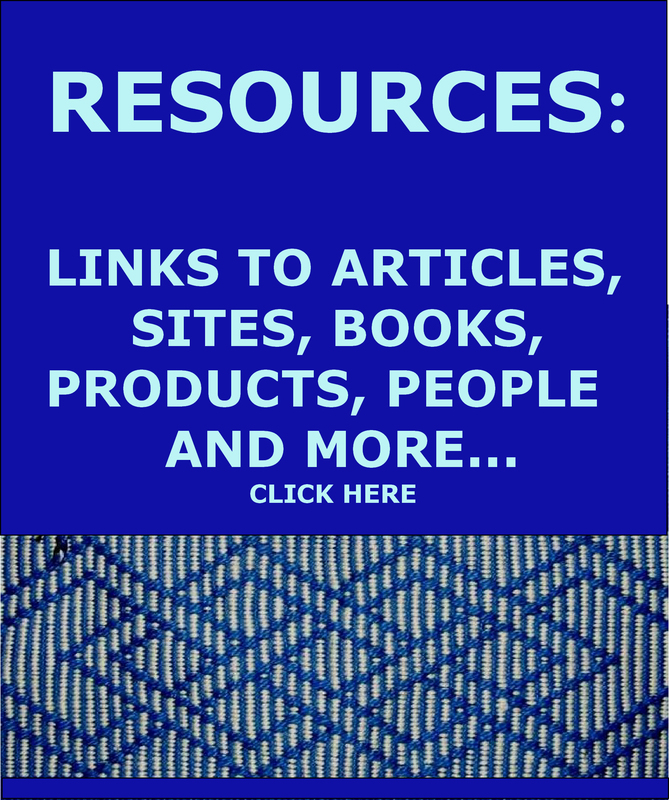 I hope you continue using a backstrap loom and find lots of reasons to do so here.